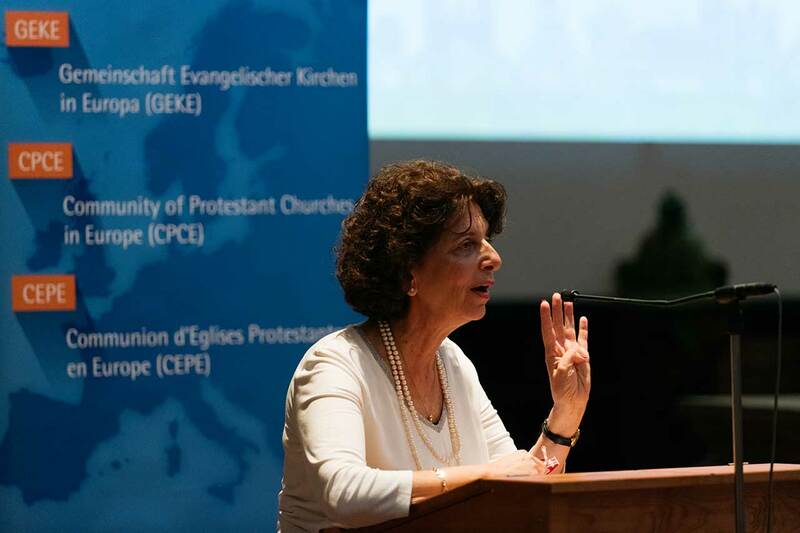 Rosangela Jarjour, the General Secretary of the Fellowship of Middle East Evangelical Churches, appeals to Protestant Churches in Europe for aid. Rosangela Jarjour has appealed for aid for the stricken populations in the Middle East to the approx. 200 participants at the 8th General Assembly of the Community of Protestant Churches in Europe (CPCE) in Basle. The General Secretary of the Fellowship of Middle East Evangelical Churches (FMEEC) described the situation in Iraq and Syria as catastrophic. “As Churches of Jesus Christ, we must raise the call for peace in both of these countries, for an immediate end to all hostilities and for instigating a political solution in Syria,” she urged in her speech in Basle Cathedral on Saturday 15 September. Jarjour called upon the CPCE’s churches to provide humanitarian aid in the name of the physical, social and psychological well-being of the Syrian and Iraqi populations and to support the Christian churches and congregations on the ground. The General Secretary identified the most acute need in Syria. She denounced the death of civilians, above all women and children, during attacks and efforts to hamper the work of the churches and their schools in the Kurdish region of north-eastern Syria. Jarjour was particularly critical of the lack of support for the churches in Syria, in contrast to Iraq. “Most of the international partners withdrew their aid during the war,” she explained, attributing this in no small part to political entanglements. “The entire world is at war in Syria,” she declared. Even major aid organisations find it difficult to implement relief efforts in the country. Jarjour acknowledged the aid that the Federation of Swiss Protestant Churches has offered to children in Syria. At the initiative of the FSPC, the General Assembly is drafting a declaration on the situation in Iraq and Syria, stating that “We cannot fail to speak out about this suffering,” and highlighting the risk that the conflict might slip from people’s minds. The FMEEC was founded in 2007. By now, it has 17 members throughout Iran, Iraq, Syria, Lebanon, Jordan and Kuwait, and reaching as far as North Africa and Sudan.